Looking for Erin Condren Planner Ideas? 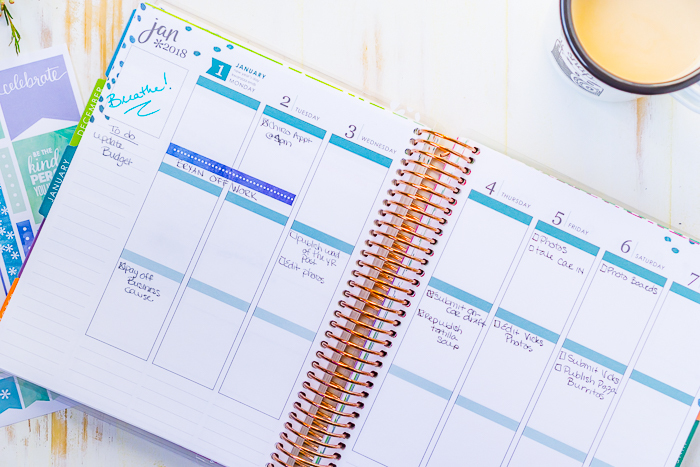 I’m sharing an inside look into my EC Life Planner for those of you who are pen and paper organizational people like myself! 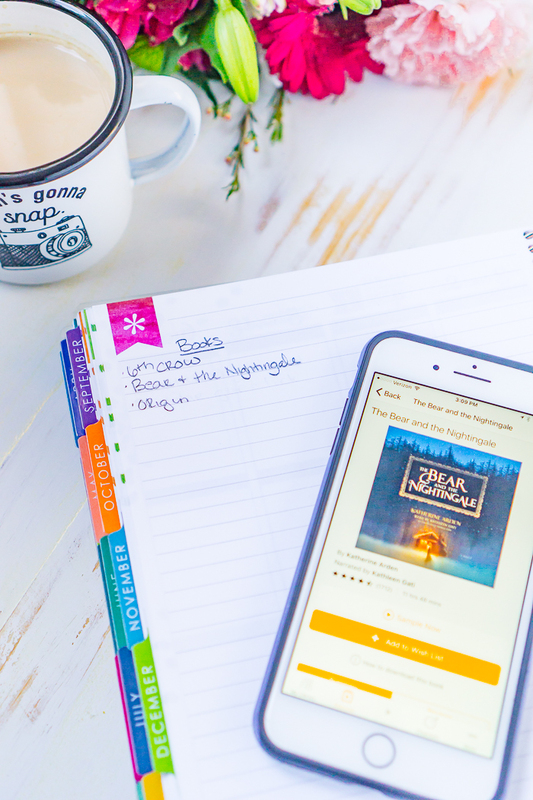 I’m sharing how I use the planner features and how I stay organized. 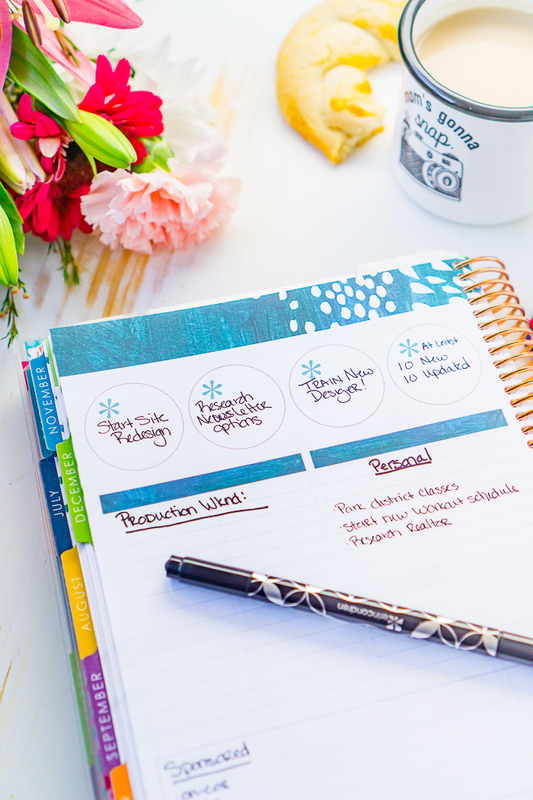 Take a fresh look at the new Erin Condren Life Planner and how I am using it today! Back in 2014, I became an EC Life Planner addict. I was struggling to make technology work for me to stay organized with Google Calendar and my Notes app, but I am simply a pen and paper kind of gal. 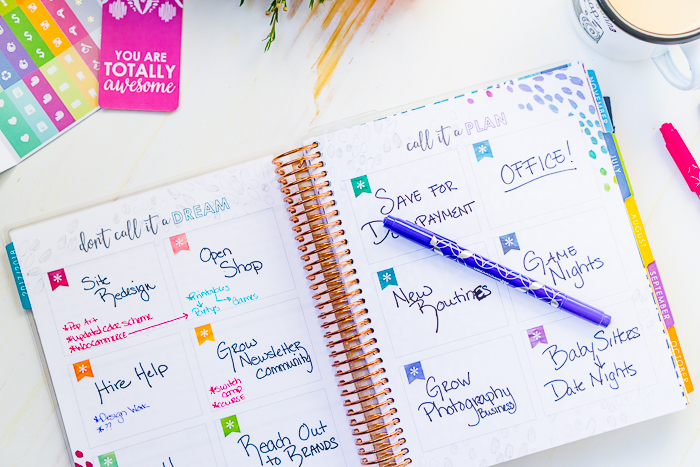 The EC Life Planner fit all of the needs I was looking for in a life planner – pretty and customizable with lots of room to write. I have written about why I chose the EC Life Planner if you are interested. Year after year it has stayed my favorite planner. I have her planners, her notebooks, her stationary, her markers, and even her canvases, so I love being able to share a product that I love with all of you. I’ve posted about Erin Condren a lot! I’m pretty sure it’s my readers favorite planner, too, as this post and my post on Erin Condren accessories has stayed two of my top ranked posts. My husband still doesn’t understand why I can’t just go all tech for my to-do lists and calendars, but that is simply not how my brain works. As much as I love technology and am counting down the days until I can get a new computer or a new phone, I think I will always be a pen and paper calendar person. I like having one clear place to write down all of my ideas, action items, and responsibilities, one place to quickly glance at see the whole picture as it lies open on my desk. Plus, I definitely get more satisfaction from crossing things off the to-do list than I do erasing them on my phone app. Before I give you a look inside my life planner though, here is my referral link for EC. If you sign up for their newsletter using this link, you will get a $10 coupon off your purchase and so will I. I don’t recommend this product because of the referral link though. I’ve used many Erin Condren items over the last four years and love them. It will not magically solve any problems, but it might help you get organized if you use it in a way that makes sense for your life and your brain! 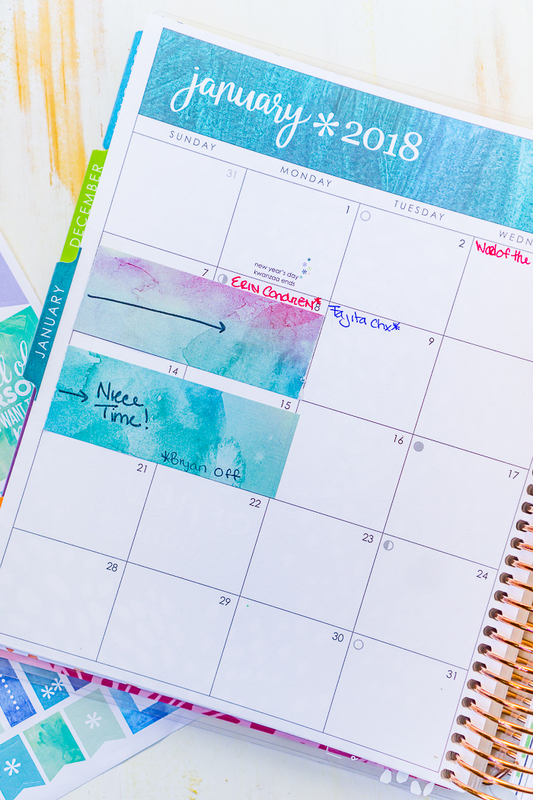 The monthly calendar is where I keep the following: birthdays, vacations, social events, work events for both Bryan and I, appointments for Liam, and the editorial calendar for the blog. Basically, I put anything there that I need to immediately see to make decisions about when I have openings for a photography shoot, if I can take on a new sponsored post, if Bryan and I are available for dinner with friends, etc. I have found that when I put all of this in my digital calendar and I have to click on each day to see the events or everything it listed really tiny, I make mistakes. Seeing my entire month at one time definitely helps me stay organized. I use Erin Condren Sticker Sheets as well as washi tape to highlight important events. For example, I’ll use a sticker to mark off a weekend that we are traveling or my inlaws are coming into town; it’s a very clear, visual sign that the weekend is blocked off. Plus I do love the pop of color on my monthly calendar! I use smaller stickers to mark off appointments, which are primarily my photo sessions booked for the month or any doctor appointments. The thing to note about the monthly spreads is that I keep these updated months ahead and continually go back to update it again while I don’t touch the weekly spreads until the month of and usually the week before. I do this because the focus of the monthly spreads for me is tracking important dates and events so we don’t have scheduling conflicts since we often do plan things out months in advance. Every month gets assigned a different sticker sheet from me and those that I am using are sitting in the pocket at the back of the planner. Lastly, on the right hand side, you will see a lined list of NOTES. These are located on both the monthly and weekly layouts and the use fluctuates more for me than other features in the planner. For the monthly list, I most like to use this to pencil ideas and big picture tasks I would like to get done for that month but am not ready to officially schedule or assign to a particular week. For example, if I still needed to get a gift for the baby shower on July 8th, I would add that to the monthly list to keep it on my radar. A newer feature in the updated Erin Condren Life Planner organization system is a monthly note page which is placed before the monthly spread and next to the quote page for that month. I hadn’t quite decided how I was going to use this space when I took the pictures but have since settled on an organization system that helps me the most. I am using the 4 top circles to set monthly goals. 4 goals is an attainable number so I don’t get overwhelmed and I can stay focused. My goals very month to month, sometimes focusing more on personal goals and sometimes focusing more on work goals. Other ideas for this space: track baby or kid’s growth or milestones, your favorites books, movies or shows at the time, or track your wellness goals. I am using the two list sections to track monthly business income and monthly business deadlines. It’s a nice one spot for me to quickly see the flow of work, especially comparing slower to busier months, and to stay on track for what I need to be accomplishing. Since my original post on how I organize my planner, I have tried all the layouts for the Erin Condren Life Planners they’ve released: vertical, horizontal, and hourly. I keep going back to my original though which is the vertical since it makes the most sense for my schedule. The weekly calendar for the vertical layout is divided into three sections. These sections used to be called morning, day and night but are now left blank for your customization, which is awesome! It’s fun to see how these three sections have changed for me over the years and my growth in business. At this moment in time, they are divided as personal, blog business, and photography business. The weekly layouts for me are really where I keep my action items and to-do lists. These are the boxes where the nitty gritty of what I need to DO gets written. I am also not usually writing on these pages until the week of or maybe the week before. The bottom of each day has a few lines for additional notes. I usually use this space for meal planning and any dinner plans we might have. Taking a moment to schedule out our meals while looking at our schedule makes it more likely for us to stay on track because I can choose a super easy meal on a crazy day or a more involved meal on a lighter schedule day. The list on the left is normally used as a place for me to put to-do list items that need to get done that week and I need to remember but that I am not ready to assign yet to a specific day. For example, when I need to remember to do laundry before packing for a trip but I’m not sure which day will work best yet. I also try to keep a small Post-It label on the left hand side of the page as well for a shopping list – it gives me a place to jot down items that pop into my head while planning and then move it to my actual shopping list later. It saves me from wondering later what I remembered a few hours ago but failing. In this new planner, you will still find page spread with 12 boxes and the quote, “don’t call it a dream, call it a plan.” I do use these pages for goal setting. If you haven’t noticed a trend, I really believe in setting goals. There are still note pages in the back of the planner though I am bummed because there seems to be less, with some of the note pages being taken over by fully designed pages that look like they are for coloring. I’m a huge fan of adult coloring, but my planner isn’t a place where I need to color. Plus, I do make use of those note pages in my planner. Big Item Shopping Lists – big items that we are saving for. I try to rank them in order of importance to me. 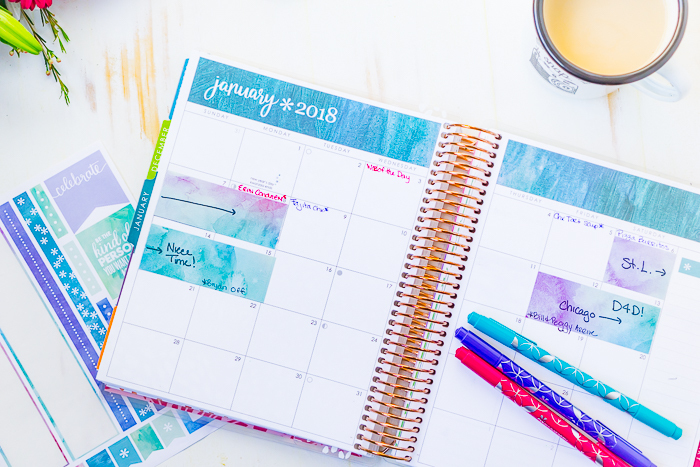 Erin Condren Life Planner: Full 18 months (July 2017-December 2018), rose gold coil, vertical layout, and colorful theme. Erin Condren Stickers – I love the sticker sheets. I don’t do a ton of crazy customizing or journaling like some do with their life planners because I don’t have time. But the sticker sheets help me visually track the important events while making my calendar a little prettier. Erin Condren Stationary: I have family stationary, work stationary, and personal stationary. It’s also one of my favorite items to gift. Hi! 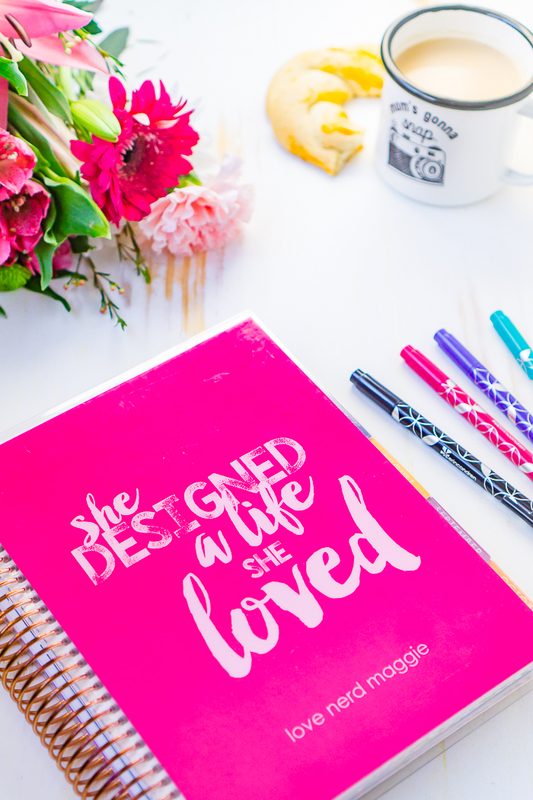 I just ordered my Erin Condren life planner and I’m so excited! But I have a question, if I want to add more pages to my planner, how do I do that? Congrats for your blog, finally I got my first EC planner and I didn’t know how to star, but I found so clears ideas about it, what I must like it’s to change morning, day and night for another options that really works for me!! Hello, and happy new year! I found you when I typed in, “Erin Condren” on Pinterest. Glad I came by. Great ideas and organization on your part. Thank you! I am so glad it was helpful, Kim, and thank you for sharing my link in your own post! I don’t know what I would do without my planner!! This planner looks gorgeous. I have just ordered my planner for next year but I’m thinking of ordering this one as well as it seems to be far more details (and pretty). Love, love, love the coloured tape. I will be shopping for some pretty colours to brighten up my planners. Thank you so much for a lovely post. Found your site about planners on Pinterest. Because of you I purchased one and am so excited to use it. I love how you have changed the sections of Morning, Noon and Night. I had been trying to come up with one that I could make and know I would use the entire thing unlike the premade ones I have used before. I saw you blog and read how you have used it and thought it was worth taking a chance and getting my own Erin Condren. I have dug out old stickers from my attempt at scrapbooking and have already started using them. Also have several rolls of Washi that I am excited to us. I am a color person and the brighter the colors the more motivated I stay. Awww, Thank you so much, Ellen! I am happy to have you here! This planner has made such a difference for me with both my personal and professional life. Much of this is because it has so many options to make it work for my life versus the other way around, but I think it’s also because of the habits. I know start and end most days with this planner. My husband and I also sit down with it once a week to make sure we are on the same page and I know his schedule. It’s been so helpful! This post is incredible! Found it on pinterest because I was looking for a planner to start using in january, this one seems perfect. I am not sure if its too late or not, but wheres the referral link? Thanks so much! Thank you for this post!! I just received my very first Erin Condren Life Planner in the mail today!! I ordered it from Tiny Prints so it is personalized with my name on the cover…I’m not sure if you order directly from EC if they come personalized or not. I enjoyed reading how you have adapted your planner to meet your needs! Thanks again! I LOVE my Erin Condren planner!! I use the weekly calendar in mine to journal sometimes. To me, it’s so much easier to do it that way than to try to keep up with another book. My notes section is all used up and written on. By the end of the year, my planner looks well used- and it has been! Susan, for the months with light enough colors like September, I just wrote over the morning, afternoon, and night part. For the months with darker colors, I added washi tape to cover them up and write over. I absolutely love my Life Planner! Feel free to ask any other questions if you have them! I’m sorry you had a hard time, Laurie. When you clicked on the referral link, did you then sign up for their email? When you sign up, they will then send you the $10 coupon to your email address. If yes, you could always reach out to their customer service. Great post! I love how your using this planner so that it is functional to fit your needs! I currently use a day timer and love it but just recently purchased an Erin Condren, so excited! Thx for the great post! I am super excited for you! I have become a little obsessed with mine as it is now constantly with me. Which cover did you get? I hope I am organized like you at some point in my life!! I love how beautiful the Erin Condren planners. I just am not sure I am ready to break up with my Levenger because I love the easy pop-in pages. What do you mean by pop-in pages? What types of pages do you pop in and where?